Bali Traditional Tour Cak Rina Dance is a Kecak monkey dance performed by Cak Rina. 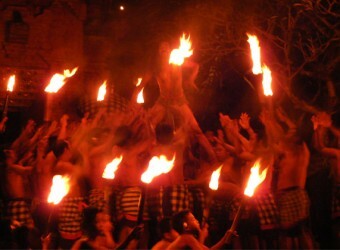 Cak Rina is a group of performers who dance the Kecak Dance only at the full moon and the new moon, the special time when power predominates over the entire island of Bali. Dancers total up to 100. These will be men and boys, dancing, while chanting in seven unique rhythmic combinations.